I travelled to 沖縄 (Okinawa, Japan) for the first time on 25-29 March 2008 to give a talk at the 22nd International Conference on Advanced Information Networking and Applications in 那覇 (Naha) with Christian. We drove nearby to discover the landscapes, relax on the coast, and reach great coffee shops and restaurants. The climate was so warm at night that I barely slept without air conditioning. Christian and I were globally satisfied by the most famous places of the island. 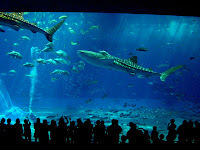 We were impressed by the depictions of war at ひめゆり平和祈念資料館 (Himeyuri Peace Museum) and by the live 7.9m-long whale sharks of 美ら海水族館 (Churaumi Aquarium), which is a great and unique aquarium. Nearby, the less well-known 熱帯ドリームセンター (Tropical Dream Center) was also worth a visit. However, we were disappointed by 首里城 (Shuri castle), a UNESCO world heritage, which was crowded and radiated a theme-park aura; we enjoyed much more the modest and quiet 識名園 (Shikina garden). After several cold months in 東京 (Tokyo), this stay was a pleasure. Although moving without a car is unrealistic, the pace is slower and the food delicious. I recommend カフェくるくま (Café Kurukuma), オリーブの木店 (Olive tree restaurant), 花人逢レストラン (Restaurant Kajinbo) with its funny menu written on a fan, ブリリアント・モトブヒルズ (Brilliante Motobu Hills), and above all the extraordinary ぱいかじ上之屋店 (Paikaji Uenoya restaurant). Beware however of the アメリカンビレッジ (American village): we enjoyed an interesting ambiance but had terrible food there. [Update 04-Nov-2008] I explored jungles, walked among traditional houses, and toured beaches in several Southern islands of 沖縄 (Okinawa) during my second trip there, from 31 October to 03 November 2008 (see Post 04 November 2008).